Pennsylvania German art is a distinctive folk style transplanted by European immigrants who settled in southeastern Pennsylvania. 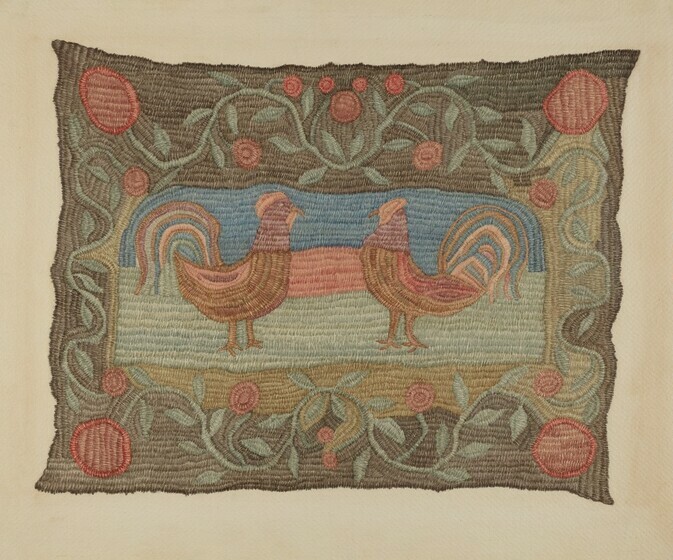 Characterized by the bold use of color and motifs that emphasize birds, flowers, and elaborate decoration, Pennsylvania German art was nurtured on the isolated farms where those settlers made their homes. Beginning in the late seventeenth century, immigrants from Switzerland, the Palatinate, and the Upper Rhine regions of Germany arrived in Pennsylvania. For the most part, they were peasants, small farmers, and artisans. The Pennsylvania Germans were industrious people; they cleared the heavily wooded lands and tilled the soil to establish a new life in America. Agriculture was the major industry, but as society became more firmly rooted, farmer-craftsmen turned some of their energies to producing and decorating the many articles of daily life. By isolating themselves from outside influences, the Pennsylvania Germans were not assimilated into the mainstream of American culture until this century. Thus, for over two hundred years, Pennsylvania German art flourished to become an important element of the American folk art tradition. In the early days when every Pennsylvania German family had to farm for its livelihood, pottery was made by farmer-artisans skilled in that craft. Having brought these skills from the homeland, they were able to supplement the family income by supplying plates, dishes, and other ceramic articles to neighboring households. Because Pennsylvania earth was rich in red clay, potters produced redware -- pottery that turned a deep brownish red after firing. 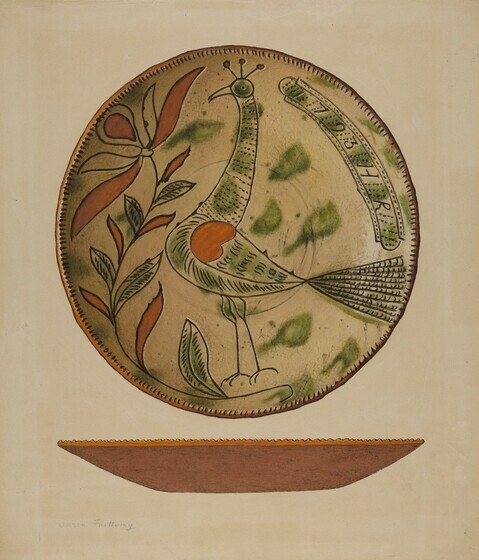 This plate, inscribed, "1793 H R," may have been made by the potter Henry Roudebush. The proudly strutting peacock and stylized flower are typical Pennsylvania German motifs. 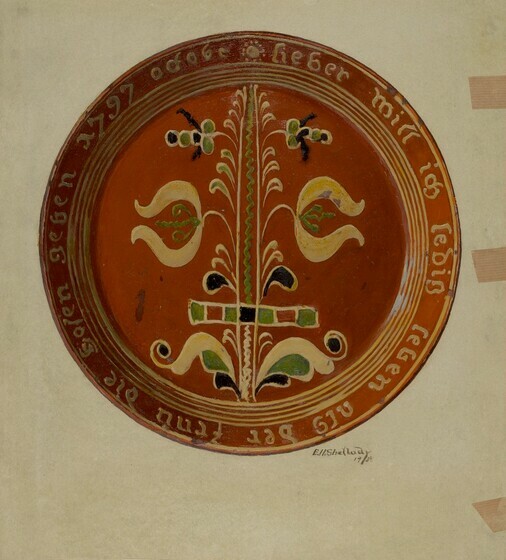 The plate is decorated by a technique know as sgraffito or "scratching." In this process the potter coated the concave surface of the plate with white slip -- a thin white clay. After it dried, the design was scratched into the white slip with a sharp instrument to expose the red clay underneath. A transparent glaze was applied and the piece was then fired. Because of their decorative nature, plates of this kind were commonly presented as gifts. Slip-trailing was another method used by potters to decorate ornamental redware. A more difficult technique than sgraffito, slip-trailed decoration resulted from pouring slip -- a thin, white clay -- from a slip cup through a goose quill. This method required great skill in controlling the thin stream of slip to achieve the desired pattern. In decorating this plate, several goose quills were used at once in the slip-trailing process to achieve the concentric lines around the border. When the slip dried, it was beaten into the piece so that the decoration became an integral part of the fired dish. 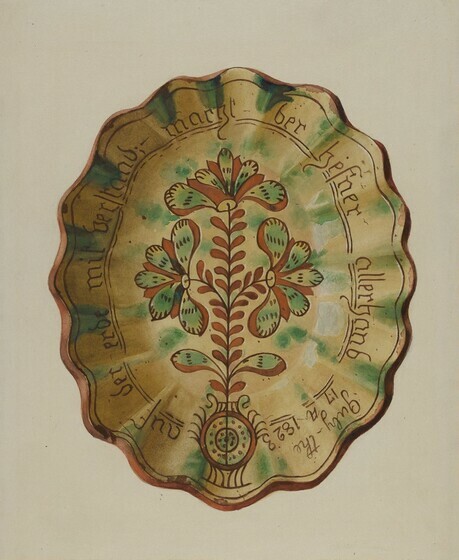 The design on this dish, representing the traditional Pennsylvania German tulip, was drawn in white, green, and black slip. Dated October 1797, the dish was made by John Leidy when he was sixteen years old. The inscription around the rim reads: "Rather would I single live than the wife the breeches give." Dishes made by Pennsylvania German potters came in a variety of sizes and shapes. This oval one with scalloped edges was elaborately decorated by the sgraffito technique. Notice the bold floral design that contrasts with the light strokes of lettering that form a delicate border. Splashes of green worked into the glaze heighten the color of the red clay that is exposed. The dish was made by Samuel Troxel. The inscription reads: "From clay and many skills, the potter fashions what he will, July the 19th 1823." 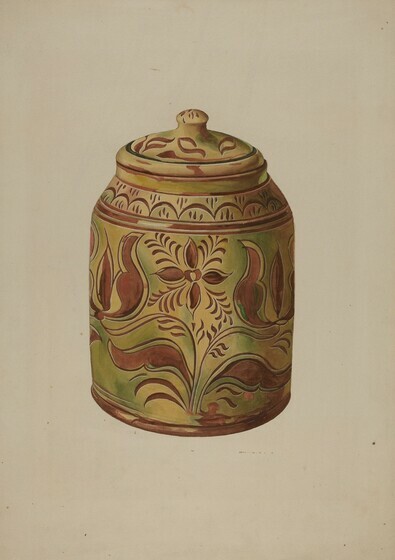 This sgrafitto jar is dated 1830. 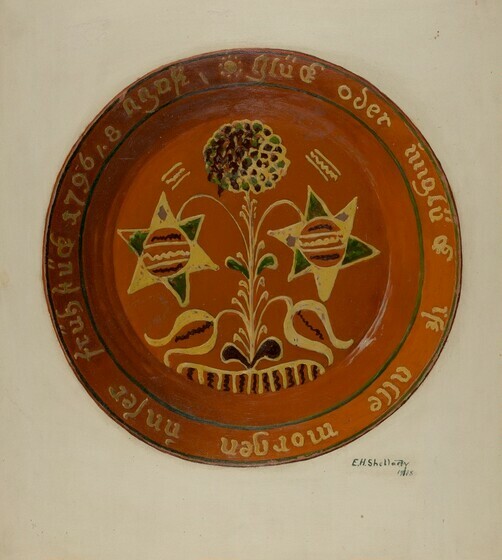 As Pennsylvania German potters became more experienced, techniques and styles became bold and assured. The design of curved tulip leaves and petals, scallops, dots, and borders is highlighted by touches of green in the glaze. Pennsylvania German glassware was best known through the artistry of "Baron" Heinrich Wilhelm Stiegel. Stiegel was a master craftsman who became a legend in his own time as the flamboyant owner of iron and glassworks. Stiegel glass cannot be definitely identified since his workers took his methods to other factories after his own went bankrupt. However, Stiegel-type flint glass, or crystal, was widely known for its beauty, fragility, and the brilliance of its colors. A wide variety of glassware -- from wineglasses, sugar bowls, and cruets to windowpanes and chemists' bottles -- was made at the Stiegel furnace. The flask shown here was a typical Stiegel product. Stiegel was the first American glass manufacturer to enamel glass. 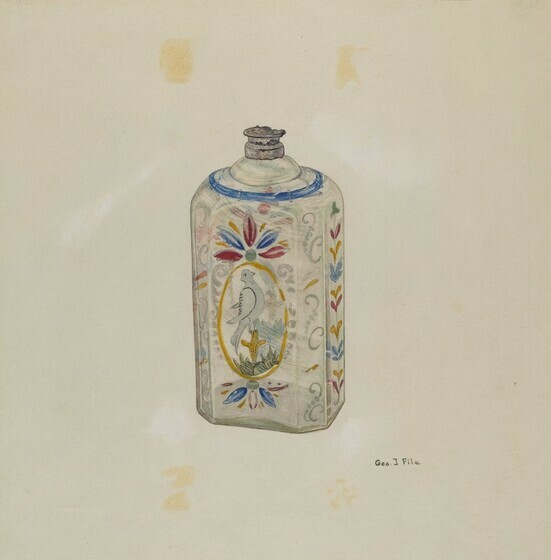 Pieces made of white, or clear, glass have their decoration of birds, tulips, and scrolls painted on freehand with red, green, and yellow enamel. 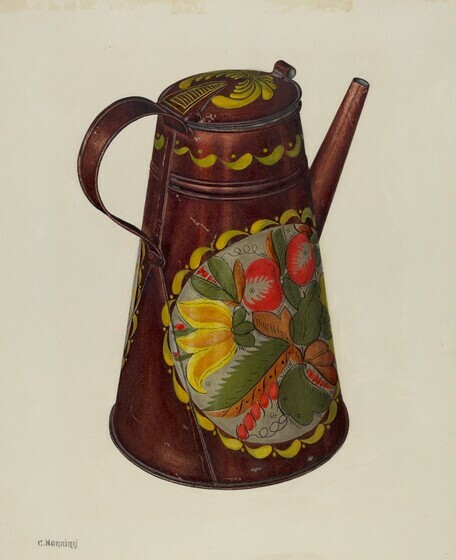 The motifs used reflect typical Pennsylvania German traditions of decoration. Pennsylvania German housewives produced most of the textiles used in their homes. Hooked rugs were made by taking short pieces of yarn or cloth and pulling them through the mesh of a backing -- usually linen or burlap -- so that the two ends were on one side. The loops could then be trimmed to determine the pile of the rug. The technique of hooking rugs lent itself naturally to a variety of colors and designs. Designs were outlined on the backing and filled in with dyed scraps. This hooked rug shows an assemblage of stars, horses, birds, trees, circles, and crescents in a gay symmetrical arrangement. The rug is hooked on a burlap base while portions of the design are worked in cross-stitch. The bold colors used are characteristic of the Pennsylvania German style. Embroidered rugs were less common than the hooked variety because they had to be made from new materials instead of scraps. 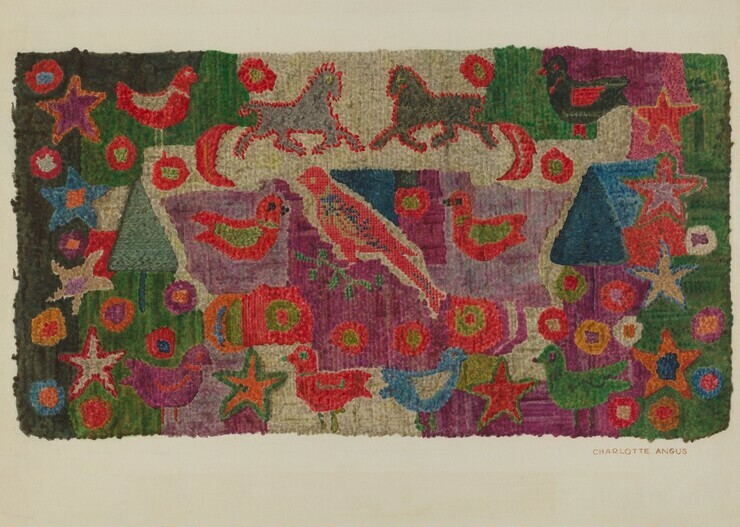 This rug of homespun wool was embroidered in bold and untraditional stitchery. Two roosters done in gray, russet, purple, and pink are set into a framelike composition surrounded by a border of flowers and leaves. The relationship of round shapes serves to unify the design; notice the round floral forms, the curves of the roosters' breasts and tails, and the rounded corners of the rectangle. The design is freely rendered in a symmetrical pattern and bright colors. Like elaborately decorated pottery and Jacquard coverlets, "show towels" were made primarily for display rather than for use. They were often hung as decorations on doors or were used to hide more functional towels when guests appeared. Many show towels were made by young girls in anticipation of marriage. Show towels were woven of flax and carefully embroidered. This example is linen decorated with traditional flower and bird motifs. 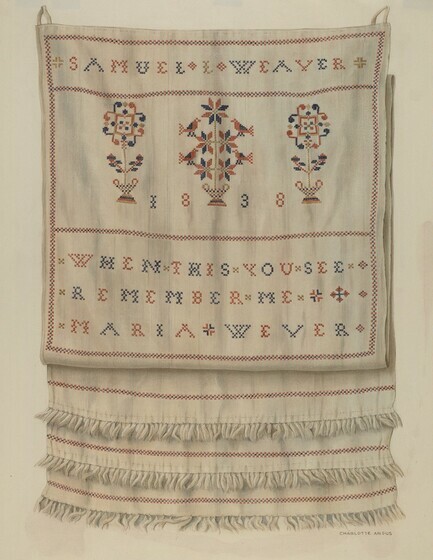 The inscription, worked in cross-stitch, reads: "Samuel L. Weaver 1838 When This You See Remember Me Maria Weaver." The five-plate, or jamb, stove was introduced by German immigrants in the early nineteenth century. Set into the wall and fired from the fireplace of an adjoining room, these stoves used fuel more efficiently than open fireplaces and provided greater warmth for the whole room. Because Pennsylvania had rich iron ore deposits, pig iron was readily available. Iron plantations established great furnaces and cast pots, kettles, and other household utensils, as well as the iron stoveplates. Stoveplates were cast in sand molds. Carved wooden designs were pressed into sand so that a relief pattern remained. Molten iron was then poured into the sand mold and allowed to cool. Common stoveplate motifs were the flowers, birds, and scrolls of Pennsylvania German tradition, as well as biblical scenes or scenes with a moral lesson. This stove is dated 1749. The front plate shows Death in the form of a horned skeleton wielding a stick against the protests of a mortal. From behind, a friend is trying to aid the unfortunate victim. Toleware is painted tinplate. Also called "japanned-ware," it originated in the Orient, spread to Europe and then to America where it reached a height of popularity in the nineteenth century. Because toleware was prized for its decoration, it was often presented as a wedding or birthday gift and reserved for display. Like this coffeepot, toleware was generally painted with a black asphaltum varnish that imitated lacquer. The decoration was executed with oil paint in bright yellows, greens, blues, and Chinese vermilion. Fruits, flowers, and ornamental swirls were common motifs. Although toleware was made in several New England states as well as in Pennsylvania, the bold colors mark this pieces as Pennsylvania German. Pennsylvania German furniture is heavy and ornate, much like traditional German peasant styles. Because the Pennsylvania forests supplied an abundance of wood, there was never a shortage of materials. Furniture, like this kitchen cupboard, was often made for the dowry of a son or daughter. If the farmer was a skilled cabinetmaker he would make the piece himself, leaving the decoration to an itinerant journeyman. Decoration of furniture was done both freehand and by stenciling. 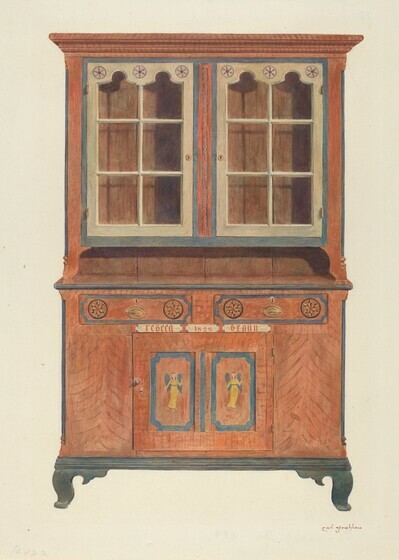 This cupboard was made for Rebecca Braun in 1828. The bright red paint contrasts with the ivory-colored window frames and green trim. The circular geometrical shapes are similar to decorations often found on Pennsylvania German barns. The angels on the door panels were traced from designs on birth certificates of that time. Cupboards were used not only for storage of household utensils, but to display ornamental pottery and toleware as well. 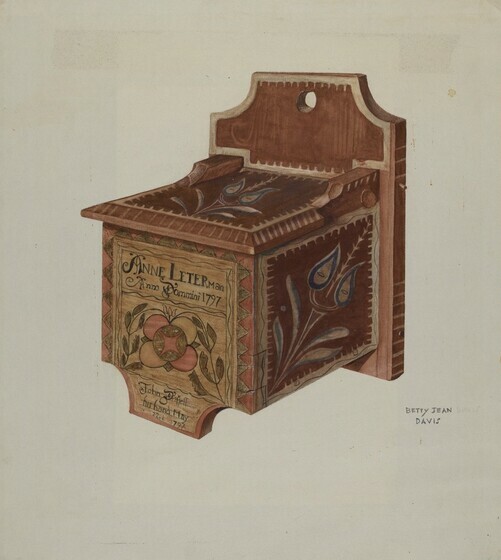 Pennsylvania Germans made wooden boxes for a variety of uses. They were often carved or whittled into ornamental shapes and then painted with decorative motifs. This box, used to store salt, was hung near the fireplace to keep its contents dry. Hanging boxes were also made to hold kitchen knives, tableware, and other utensils. 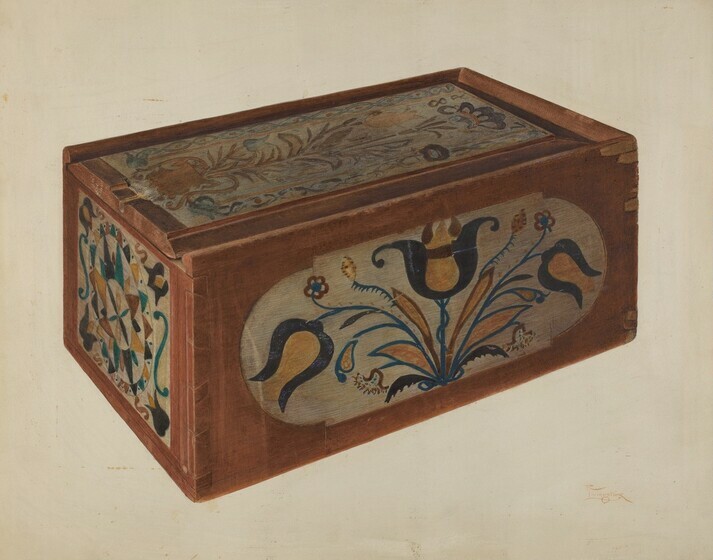 The floral motif decorating this box is surrounded by geometrical shapes and a white notch-like border. The box is inscribed with the owner's name and that of the craftsman: "Anne Leterman Anno Dommini 1797" and "John Drissell his hand May 22nd 1797." This is a candle box dated 1738. Made with a sliding lid, it is decorated with a floral and geometric design painted in bright colors. Notice that the panel in front is recessed so that the dark background forms a frame around the symmetrical tulip motif. 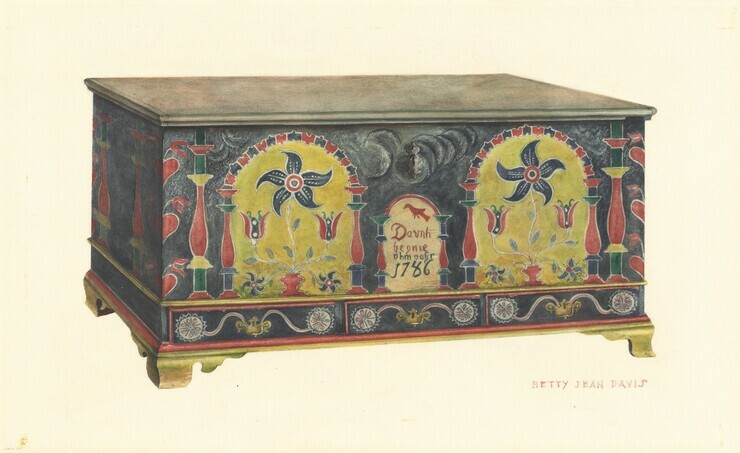 Dower chests were a necessary item for every Pennsylvania German girl preparing for marriage. They were used to store the linens, needlework, and household accessories that she collected over the years. 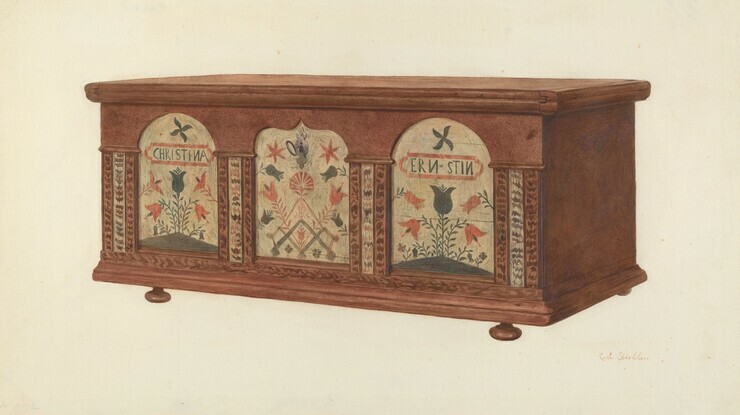 Like other large pieces of furniture, dower chests were made by the village carpenter or by the farmer himself, but they were painted by an itinerant decorator. Usually three to four feet long, they were placed in the bedroom or parlor. 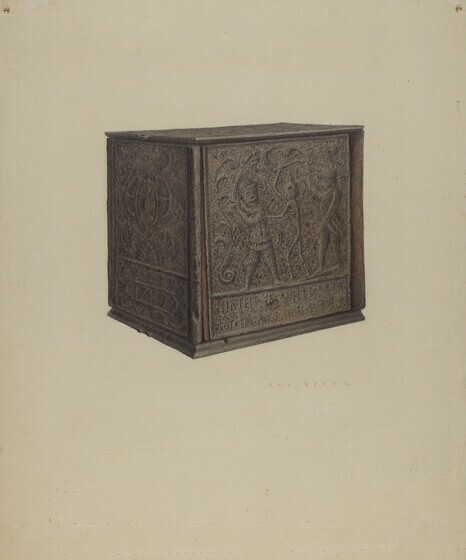 Dower chests were decorated with traditional symbols: flowers, birds, hearts, scrolls, and geometrical designs. This one, set on bracket feet, displays typically bold and elaborate decoration. The painted panels suggest an architectural arrangement, a common mode of decoration. Ornate columns and arches enframered and black flowers growing out of urns. The small central panel was reserved for the bride's name and the date, while the side panels extend the architectural motif. An architectural arrangement was not always painted onto dower chests but was sometimes built in. This chest is constructed with three recessed panels divided by brown and ivory-colored pilasters. Red and green flowers and stars on an ivory ground provide the decorative motifs. Made in the late eighteenth century, this chest is set on onion feet. It is inscribed with the name of the original owner, "Christina Ernstin." Wood carving and whittling were favorite pastimes of men and boys in early America, and particularly in the Pennsylvania German region where wood was abundant. 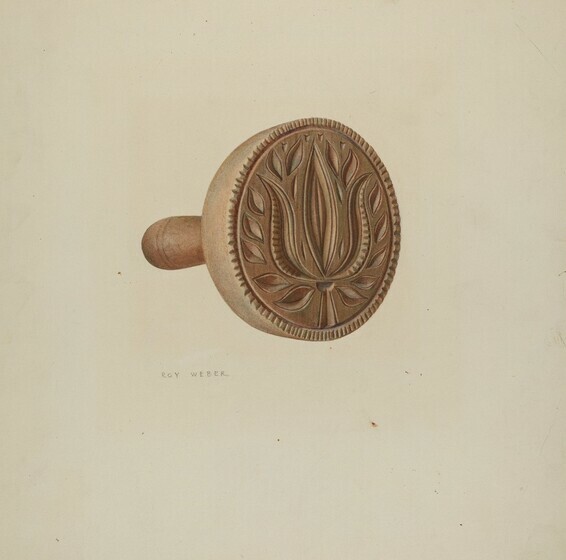 With only a small knife and a block of wood, amateur carvers created a variety of useful and decorative items for the home. 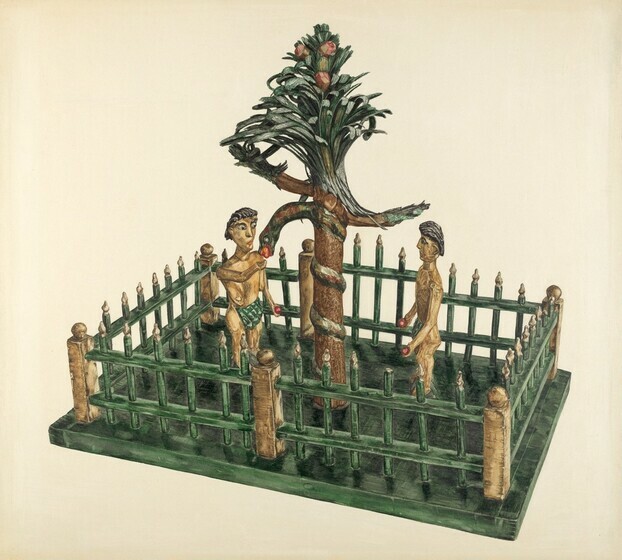 This carved group of "Adam and Eve in the Garden of Eden" was done by Wilhelm Schimmel. An itinerant carver of the mid-nineteenth century, he wandered throughout the southeastern counties of Pennsylvania exchanging his whittled animals and toys for a meal or a glass of rum. This unusual carving may have been a "Sunday toy" -- a toy with which children could play on Sundays when boisterous activity was not permitted. 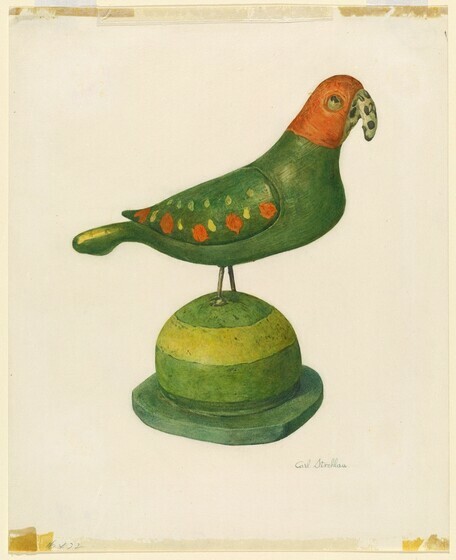 Schimmel carved each of the pieces in this group separately, then combined them and finished the work with oil color. While technically crude, Schimmel's carvings are treasured for their lively portrayal of his subjects. This owl was whittled by Aaron Mountz, a friend and follower of Schimmel's. 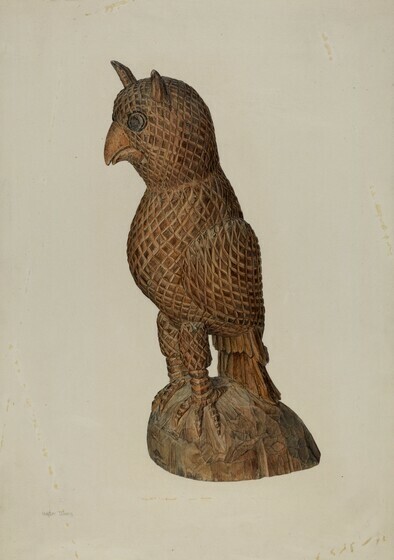 Birds were a favorite theme of both wood-carvers. This one is done with a naturalism of form that is enhanced with the detail of stylized feathers. By careful cross-hatching, each feather is represented in a way that is lively while providing an interesting surface texture. Mountz has rendered this carving not only as an individual owl, but, by its wise and aloof countenance, as a symbol of owl-ness. Though many of his carvings were painted, Mountz left this owl in unfinished wood. This polychrome bird resembles a parrot. In contrast to the naturalistic detail of the owl, the parrot is smoothly stylized and painted in the bright colors typical of Pennsylvania German decoration. Because thin wooden legs could easily break, the carver has ingeniously substituted wire to mount the bird on the sawed-off finial of a bedpost. Because "printed" butter was more appealing to customers than plain bricks, butter molds were used to shape and stamp decorative patterns on the butter sold at market. Pennsylvania German farmers carved the molds that their wives used to prepare the butter for sale. Turned on a lathe, this mold and its handle were made in one piece. Popular motifs were sheaves of grain, hearts, American eagles, and flowers. This mold shows a large, symmetrically designed tulip surrounded by small leaves and a notched border. 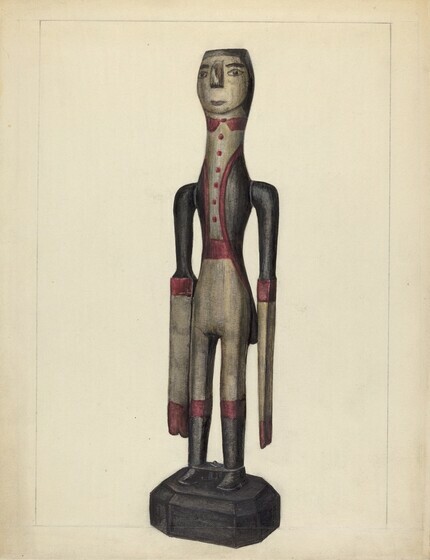 This carved figure is a whirligig. Used as both a toy and a weather vane, the whirligig was made so that the paddlelike arms could rotate in the wind. The head and body are made from a single piece of wood while the arms are attached by a rod that passes through the shoulders. Made about 1840, this whirligig was probably carved by an amateur. Fractur is a term referring to a style of writing as well at to the illuminated documents on which it was executed. Brought to Pennsylvania by German scribes, fractur was an art form peculiar to the Pennsylvania Germans. Fractur writing was based upon the sixteenth-century fractur typeface, a loose imitation of bold, rigid Gothic lettering. In the German manner, fractur painting followed the tradition of medieval manuscript illumination. The fractur writer held several positions within the Pennsylvania German community. As the representative of learning, he was often the schoolmaster as well as clergyman. With his skill in drawing and writing, he performed such services as illustrating books and hymnals and drawing up important documents. This fractur is a hymnbook illustraion that commemorates the 100th Psalm. Bold lettering contrasts with lighter, more graceful forms. 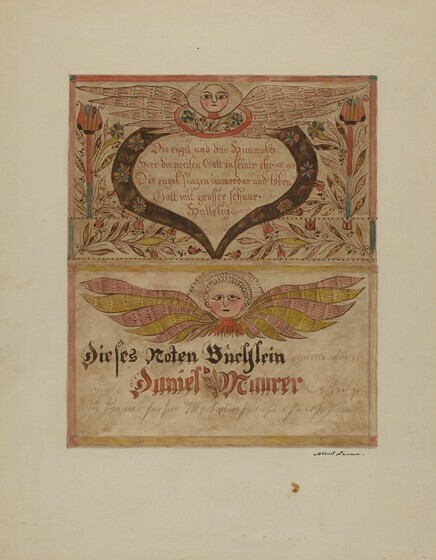 The decorative motifs of angels, tulips, and stars were hand-drawn and colored. This is a woodcut done by Heinrich Otto in 1722. A versatile decorator, Otto made fracturs drawn and painted by hand as well as printed from blocks of wood that he carved himself. This woodcut was added to a printed sheet and colored with paints and dyes made from materials at hand. 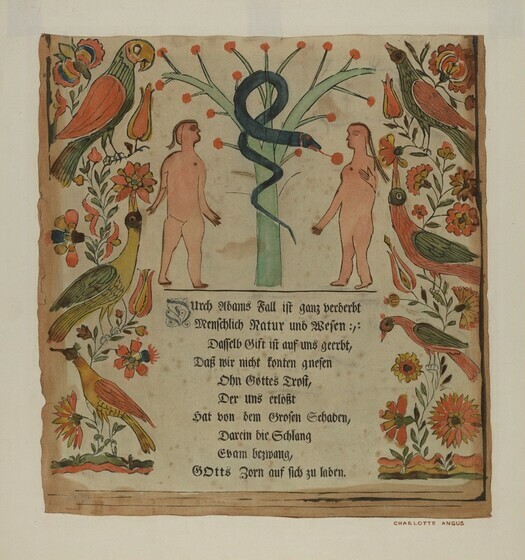 Used as a wall decoration, the text is a hymn telling the story of the Temptation of Eve. Traditional bird and flower motifs frame the text and central illustration of the story. Notice the colorful birds and flowers in contrast to the primitive human forms and the sticklike tree. Births, baptisms, and deaths were three important family occasions recorded in fracturs. Because such records were required by law in the old country, the tradition was continued in America. This is a birth certificate recording the birth of Lea Herold, April 5, 1824. Done on old wrapping paper, the elaborate design dwarfs the writing. 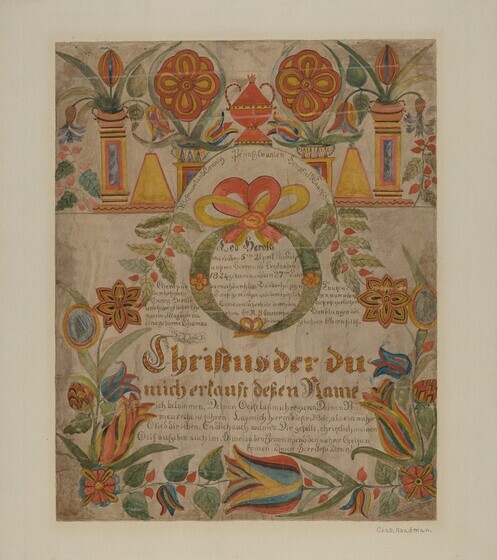 Flowers sprawl profusely over the page in the bold colors that mark Pennsylvania German art.